The measles virus is sparking grave concern worldwide, as the highly contagious airborne disease makes a resurgence. In recent months, it has been spreading in countries including the United States, the Philippines and Madagascar. News Stream speaks to Heidi Larson, Director of the "Vaccine Confidence Project." More people have died from measles in the Philippines so far this year than in all of 2018, with experts warning about 2.6 million children remain at risk in the country. The outbreak has killed 261 people this year alone -- and most of the victims were children aged under five, the International Federation of Red Cross and Red Crescent Societies (IFRC) found. This compares with 202 total deaths in 2018. And that was a 547% increase on the previous year. "It is completely unacceptable that children are still dying from measles in 2019," said Richard Gordon, chairman and CEO of the Philippines Red Cross. The IFRC, with the Philippines' Department of Health, is now aiming to immunize all unvaccinated children across seven of the "hardest-hit regions" over the next 12 months. "We are drawing on the skills and dedication of our two million Red Cross volunteers to go door-to-door and neighborhood-to-neighborhood," Gordon added. Filipinos' confidence in vaccines fell dramatically after a 2014 scandal involving a new dengue fever vaccine, Dengvaxia. Those with no history of dengue were at a greater risk of developing a more severe form of the disease after having the vaccination. Rudy Constantino, director of the Philippines Department of Health Disease Prevention and Control Bureau, told CNN Philippines that vaccine levels for measles, flu and other diseases dropped from 70% in 2017 to 39% in 2018 "because of the Dengvaxia scare." Gundo Weiler, the World Health Organization representative to the Philippines, said the country was now suffering from a measles outbreak "every three to four years," pointing to large-scale outbreaks in 2011 and 2014. As many as 20,000 cases were recorded in the last major outbreak, which Weiler said was comparable in magnitude to the latest episode, which has infected more than 1,500 people in recent weeks. The IFRC is now working to restore confidence in vaccines. 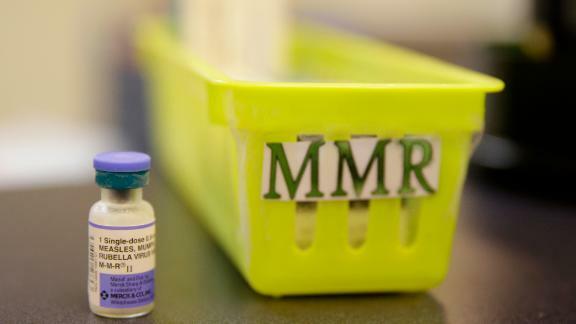 "The vaccine has been available for decades and provides almost 100% protection from measles," Gordon said. "We urge every parent to vaccinate their children to protect them and other people with whom they come into contact." The Philippines outbreak comes after global measles cases increased by 48.4% between 2017 and 2018, according to UNICEF analysis.